Take a seat on the magic carpet and get ready for a wild ride – there’s a huge progressive jackpot to be won here! 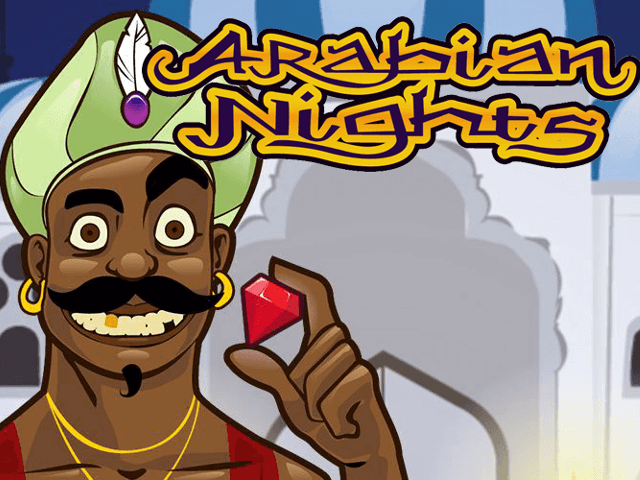 NetEnt's Arabian Nights online slot machine has been creating millionaires since its release in 2005, and the game’s enduring appeal means it has outlasted many young pretenders to its throne. Alongside the jackpot prize there’s a free spins round in which up to 30 freebies, each with a three-times multiplier, can be won. While the gameplay in this Arabian Nights online slot might seem rather basic to some, it’s hard to argue with a game that’s made several millionaires since its release. 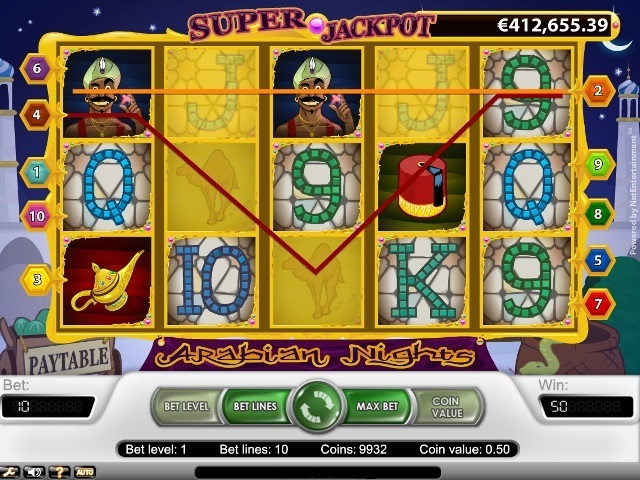 Play Arabian Nights Slot Demo for Free! Play Arabian Nights for Real Money! The theme of the Arabian Nights slot is – surprise, surprise – a trip to the Middle East, and you’ll find camels, fezzes and those cool slippers that curl up at the end lining up on your reels. The wild symbol is a dapper Middle Eastern gentleman who we might just suggest is a genie, given that the scatter icon is a golden lamp. But you don’t need three wishes to win the progressive jackpot in the Arabian Nights slot – just plenty of luck. This slot title is powered by NetEnt, and it remains a jewel in the crown of this software provider more than a decade after release. As ever, the object in the Arabian Nights online slot machine is to reveal three or more of the same symbol on one of the ten active paylines, but there are other ways to trouser a handsome prize. The wild symbol is the Arabian Nights logo (the genie we mentioned earlier), and the role of this icon is to double all wins in which he forms a part. Players are also rewarded for matching two to five of the avatar on a payline, with a full set of five triggering the jackpot prize. The scatter character is the genie’s lamp, and in addition to paying a top prize of 500 coins for matching five anywhere on your reels, this also unlocks the free spins bonus. 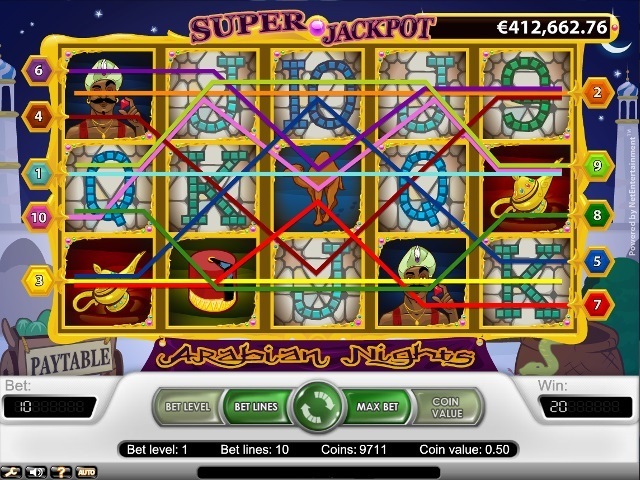 You’ll need three or more lamps on screen to trigger the feature, and in the first instance players are handed 15 free spins, which each come backed by a three-times multiplier. Should you reveal three or more lamps on any of your free spins, then further freebies will be added to your collection to take you up to a maximum of 30. 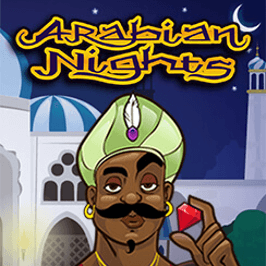 The Arabian Nights slot progressive jackpot is known for having created numerous millionaires in the past decade. What do you need to do to land the big fish? The answer is nothing out of the ordinary, really. The bet per spin amount in the Arabian Nights online slot game is non-negotiable, and that means each and every spin of the reels has an equal chance of triggering the pay-out. Players are looking for five of the Arabian Nights symbol on their reels – it is as simple (on paper) as that! Where’s that magic carpet so we can jump on board and take a spin…? Share this Arabian Nights Review today! If you like Arabian Nights, you'll love these slot titles too!